Some people find it hard to believe that a face like this can be found on an animal in Ohio. It looks to me like something you would see on the Outer Limits. 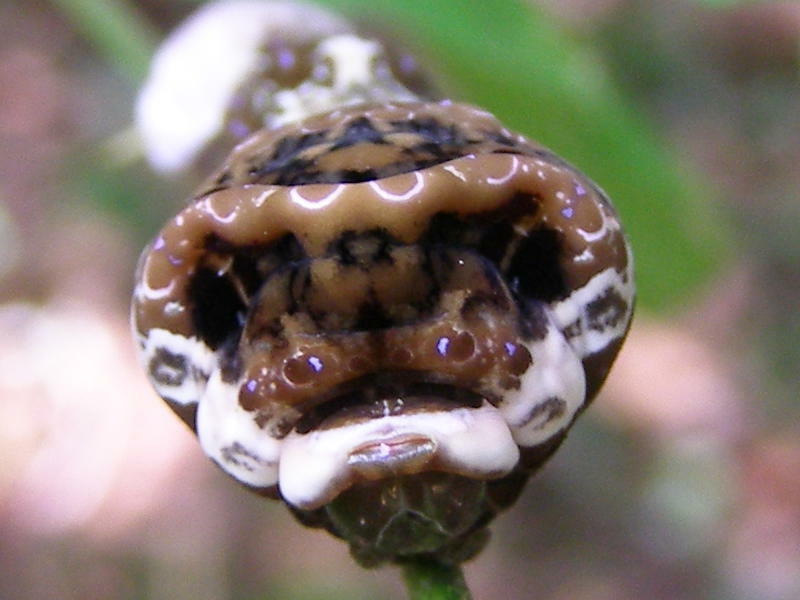 This is the front end of a Giant Swallowtail Larva and the face is just a decoration that’s part of its defensive arsenal. 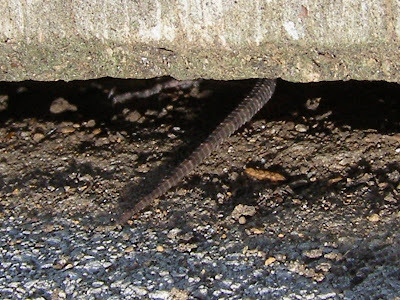 The actual head is located below that mouth-like slit. 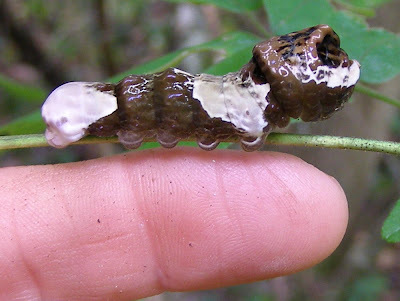 Earlier this year I showed the young larvae that depended on their resemblance to bird droppings to avoid being eaten. Larger specimens still bear a bird dropping appearance, but they are much more noticeable and have gained a few additional tricks to avoid being something’s meal. 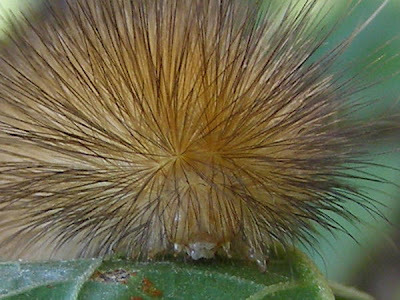 At the slightest disturbance, the enlarged thoracic region of the caterpillar raises to display its mask to a potential predator. 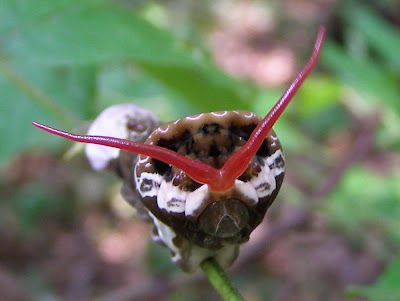 A show of eyespots is often an effective way to scare off birds. 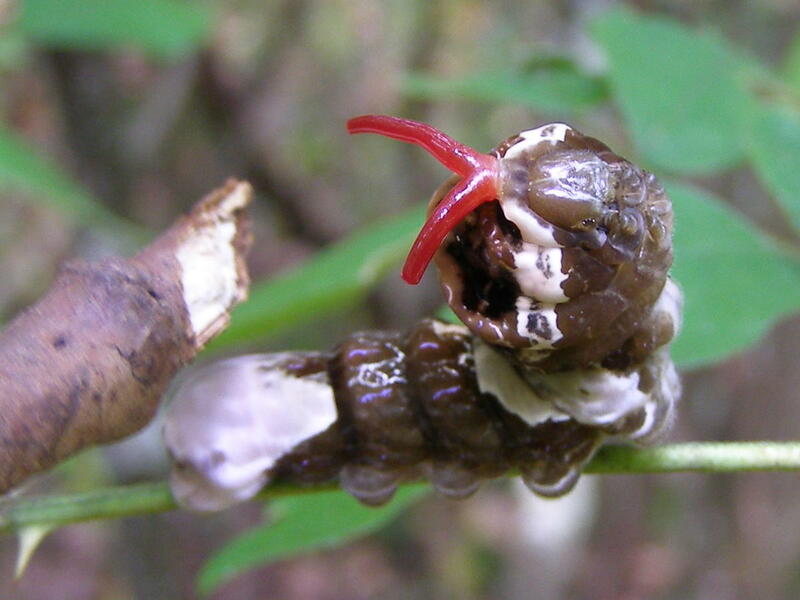 A more aggressive disturbance causes the caterpillar to draw its weapon, a projectable organ known as an osmeterium. The osmeterium exudes an unappealing substance that combines touch and smell to deter predators. In cases like this, I usually attack using a stick so as to avoid carrying the odor with me on my fingers. If the attacker comes from the front, the osmeterium takes on the appearance of a snake’s tongue, another visual deterrent to attack by birds. This larva is about an inch and a half long. 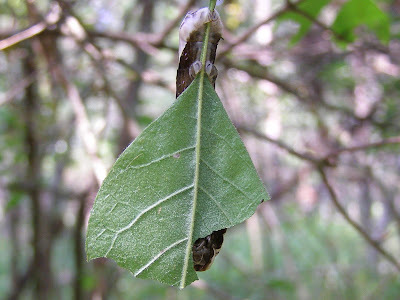 It won’t be long before it moves off to find a suitable place to form a chrysalis, the form in which it will spend the winter. Maybe I’ll see this guy in adult form next spring. I found several suitable photographic subjects. There are many fluorescent blue spots and streaks that make the caterpillar appear to be throwing electrical sparks. I wonder if those might serve as another warning to potential predators. A single clump of Prickly Ash contained half a dozen larvae. Most were resting quietly on the stems, but this one was busily consuming a last leaflet. There’s quite a defoliation effort going on here. Fortunately, there are only one or two larvae per shrub. If these can all make it through the winter, next year may surpass our current record butterfly numbers. 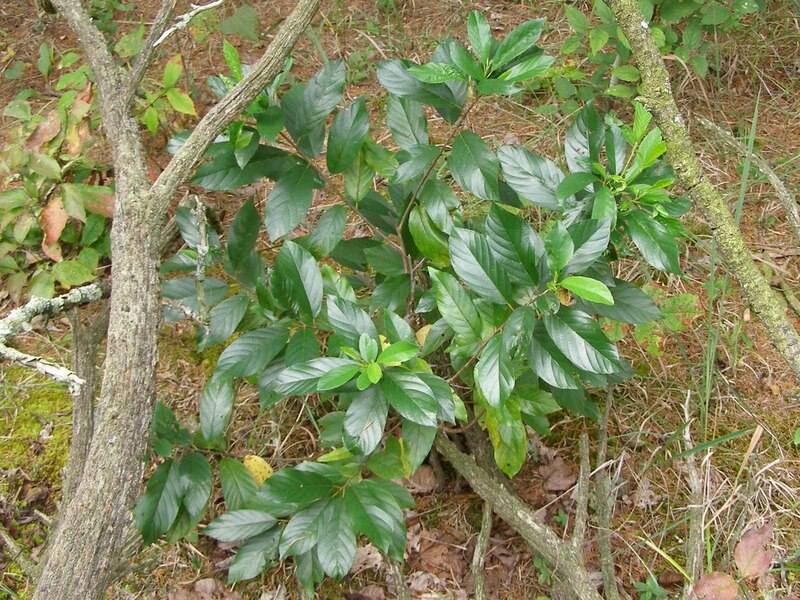 Carolina Buckthorn, Rhamnus caroliniana, is one of my favorite shrubs. 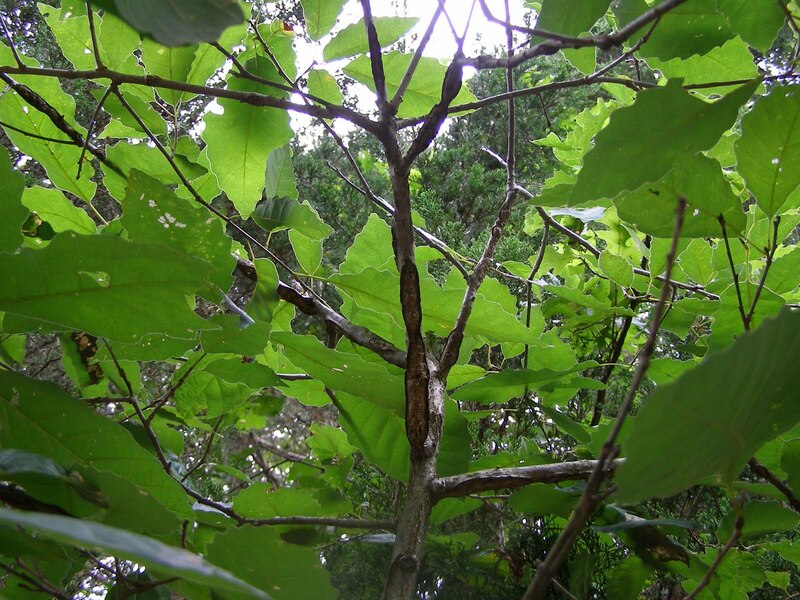 Part of the attraction is the sheer beauty of the plant itself, with its large glossy leaves. The second reason has to be the fact that the plant is a rarity in Ohio. 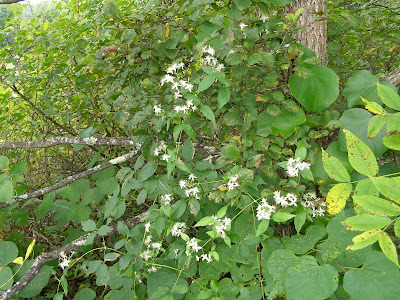 I normally find this shrub growing on the edges of the prairie openings or as an understory plant in the cedar thickets. 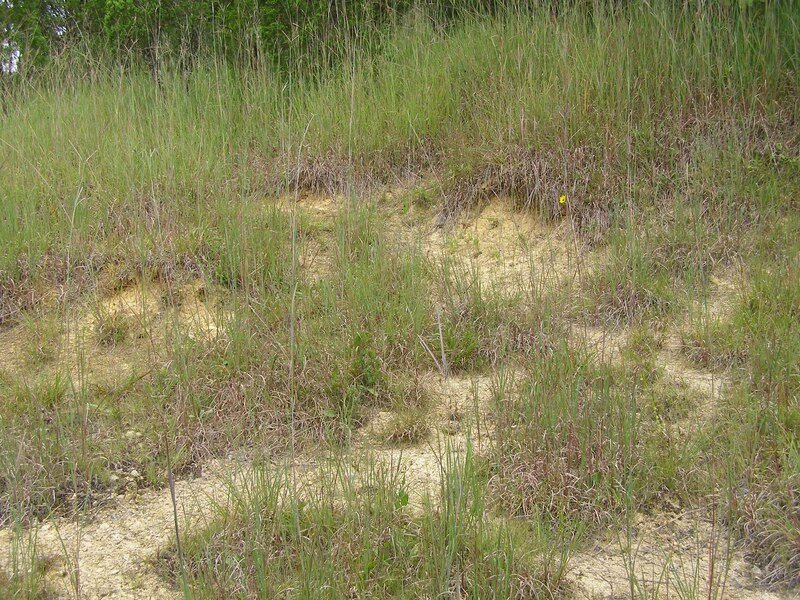 In one area it grows on an open ridge top. There’s evidence that the ridge top was much more closed in the past. There are old tops from large cedars that were probably cut for logs about 30 years ago and several skeletons of Redbuds that must have lived along with the cedars. 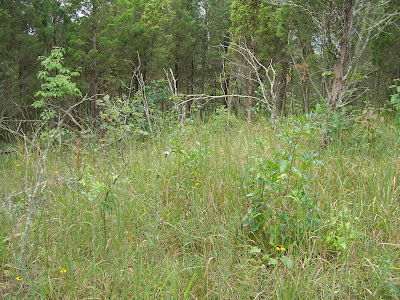 Small Carolina Buckthorn now grow along with the tall grasses. 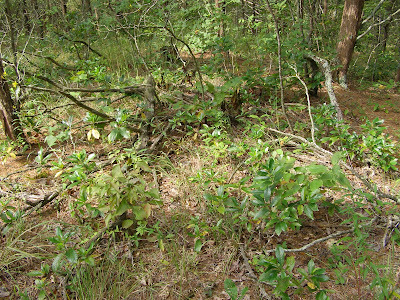 There were a couple of large Carolina Buckthorns that lived on this ridge, but they were killed by extremely cold temperatures about 20 years ago. 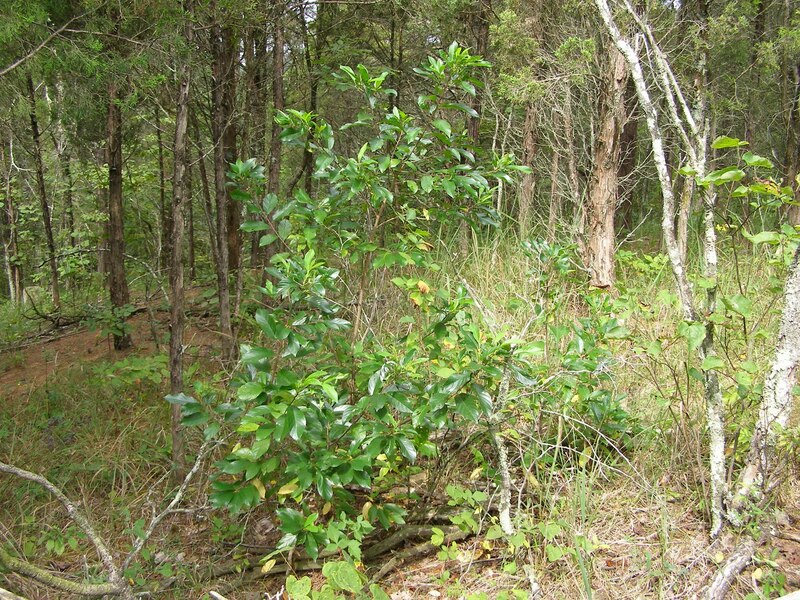 This shrub is a southern species and the populations here are at the extreme northern limit of their range. This ten foot specimen represents a large size for this area. I would try a couple of these as landscape shrubs around the house, but I know they will suffer the loss of their top growth every few years. 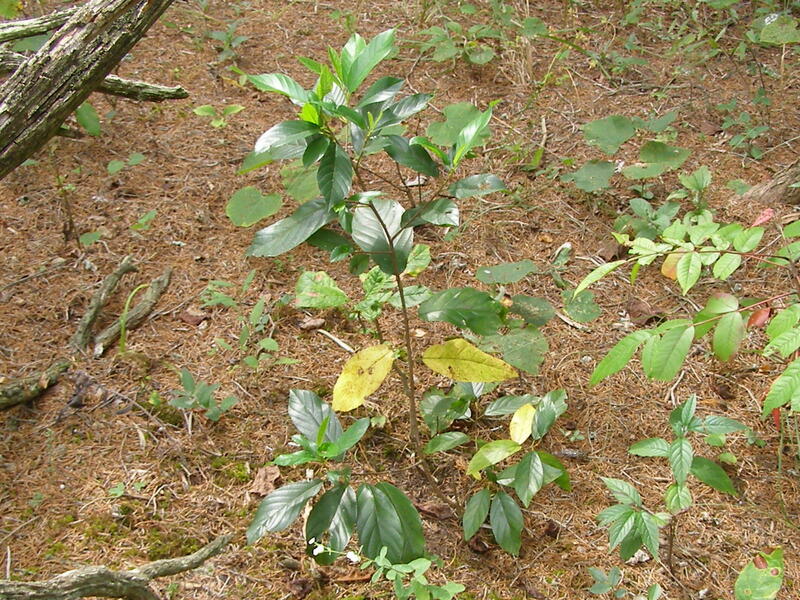 Where once there was one large shrub, there are now dozens of smaller plants. 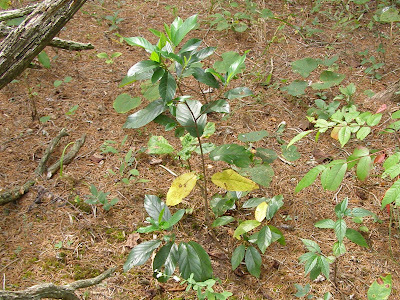 The short plants are usually protected by a covering of snow during the coldest part of the winter. 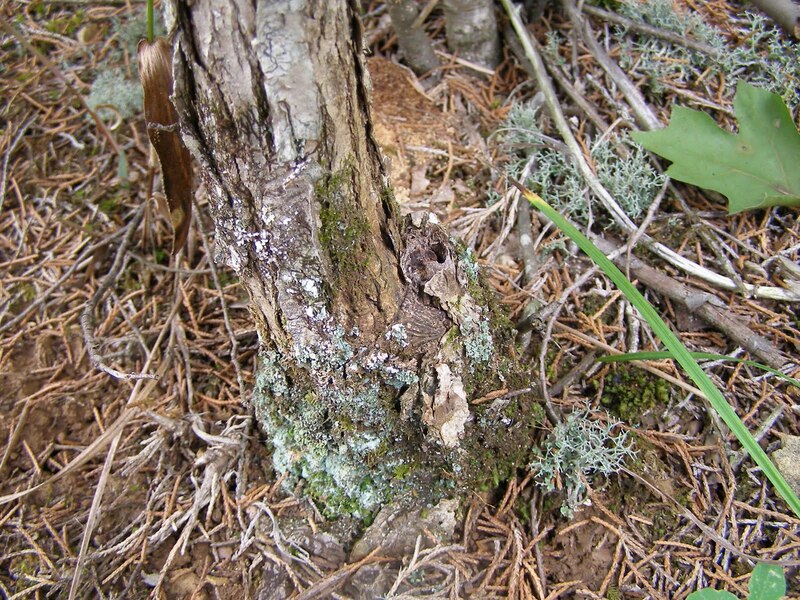 Once they reach a height that exceeds the typical snow levels, the top growth suffers frequent die backs. Only a few of the hardier plants seem to survive to get any real height. 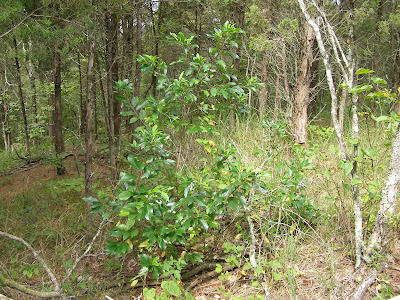 The dry, rocky conditions in which the Carolina Buckthorns grow doesn’t seem to have any adverse impacts on the plant. Even during the hottest and driest of summers, the shrubs present a perfectly healthy appearance. Even though the population itself seems healthy, there are always some individuals that show signs of disease. Several of the little plants on this ridge top show signs of canker growth that is probably the result of some fungus infection. It makes for some odd shaped plants when you add disease damage to that already inflicted by the weather. Even under ideal conditions, these diseased individuals would probably never grow large enough to produce fruit. I’m beginning to see hairy caterpillars on the move. 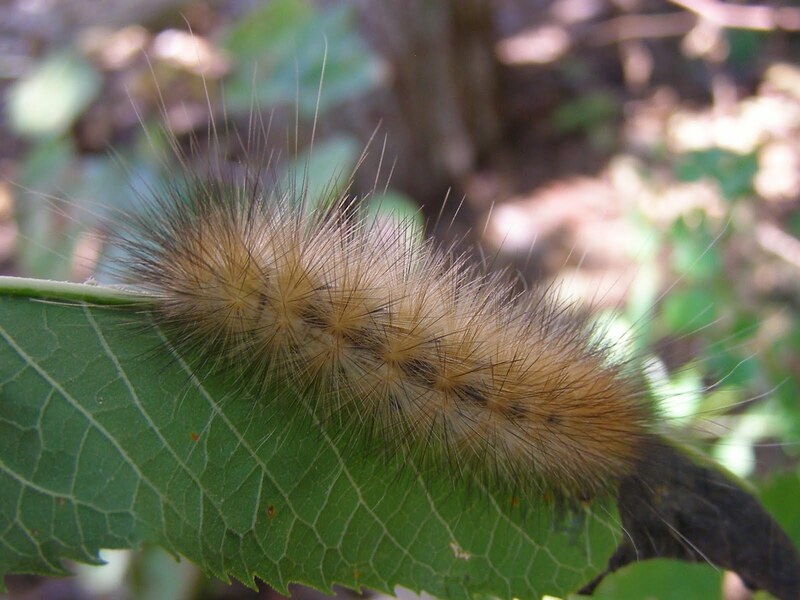 During late summer and early fall, various species of hairy moth larvae finish feeding and go charging off overland to find a suitable place to pupate. The coloration on the mouth parts on this guy makes it look like he’s got quite a set of teeth. 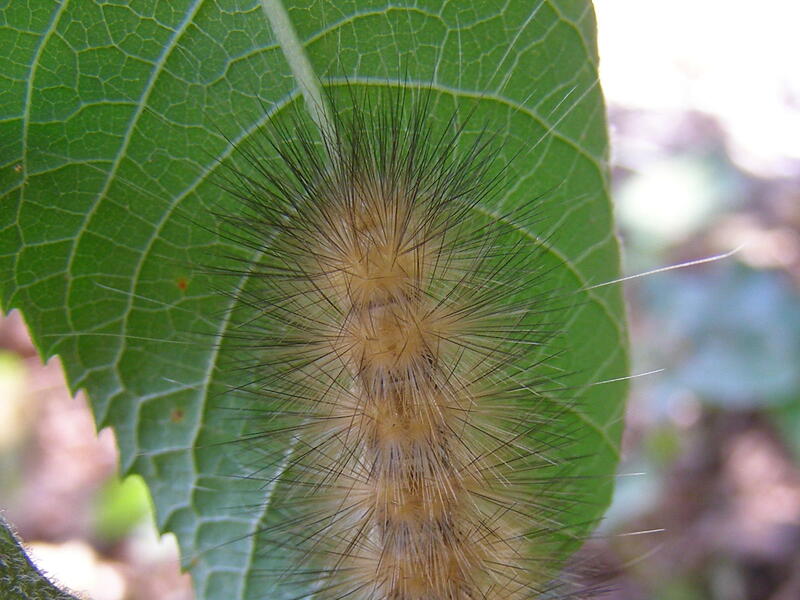 When I was eleven and twelve I used to ride my bike up and down the roads looking for caterpillars like this one. I had a shoe box with a hole in the lid taped to my handlebars and I would scoop caterpillars from the road and drop them through the hole into the box. My daily catch would be transferred into larger, leaf filled boxes in the garage. The sound of rustling caterpillars could be heard coming from the boxes for many days. Finally, the caterpillars would pupate and everything would be still. In the spring, I would open the boxes every few days to let out all of the moths. 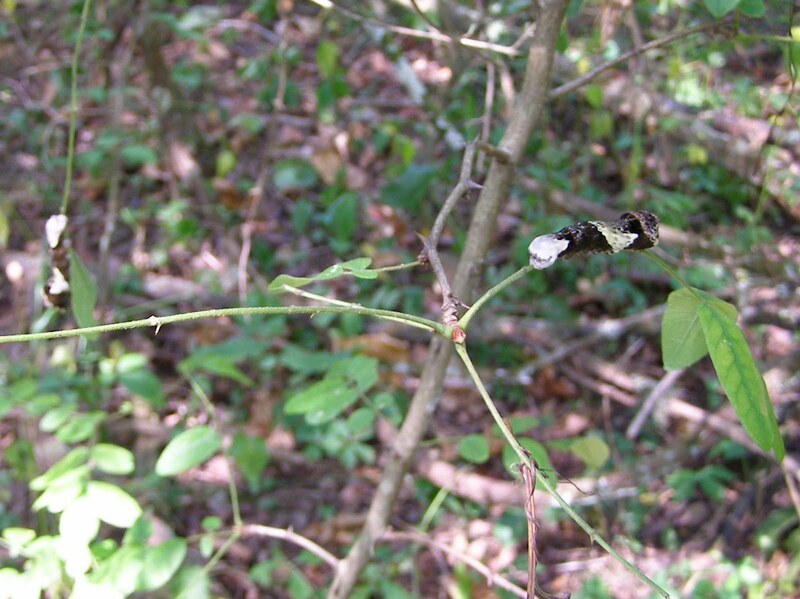 There was always a large assortment of species, none of which I could identify or even match to the caterpillar. No scientific value, but a lot of fun. From above, it’s pretty hard to tell which end is which. Sometimes it’s even tricky when you look from the end. This is a shot of the rear of the caterpillar. The foot-like things are part of the last set of prolegs. 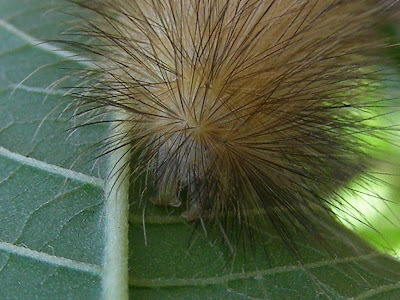 The first three sets of legs on a caterpillar are part of the thoracic section and are the six true legs characteristic of insects. The rest of the legs are growths from the abdomen and are known as prolegs. 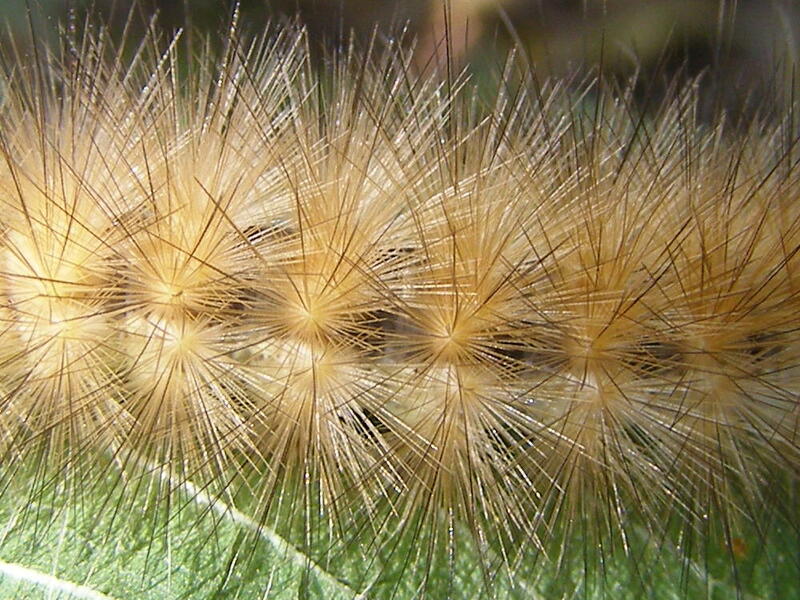 Caterpillar hairs are not equally spaced on the skin as you would find in mammals. 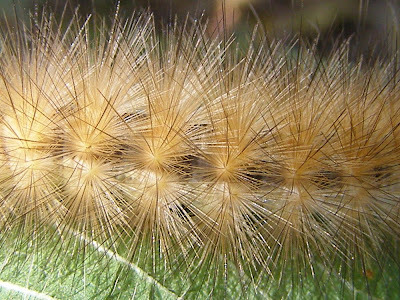 The hairs radiate from specific growth points located on each individual segment. This gives each cluster of hairs a starburst pattern. This caterpillar was feeding on a small ironweed and the leaves show a lot of feeding damage. Photos were taken in the morning. When I went by in the evening, the caterpillar was no longer on the plant. Maybe it’s off on its journey to find a pupation site. 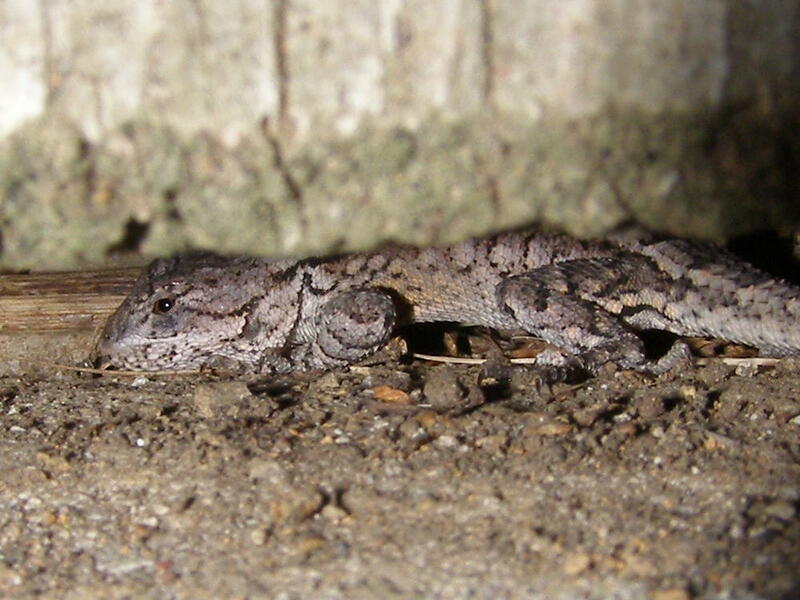 During the last two summers, I had a large female Northern Fence Lizard living near my barn. 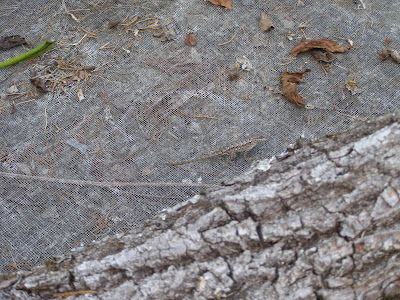 Late last fall, her dried carcass showed up near a tree at the corner of the barn. I knew it was her because of a distinctive scar she had on her back. 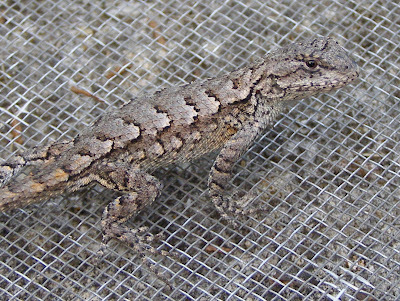 I hoped that she had successfully laid a clutch of eggs and earlier this year I began seeing many small lizards that I assumed were her offspring. 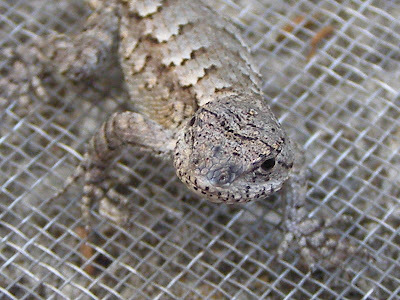 This little guy is about half the size of the female. I tried to get him to pose on a more natural background, but he wouldn’t leave the sheet of window screen that had previously been deployed to keep chipmunks out of one of my big flower pots. His coloring does make him hard to see against the screen, so I guess this is a fine place for him to hang out. I’ve never seen a Fence Lizard that didn’t know it was being watched. If you’re close enough to see them, you can bet they’ve already seen you. 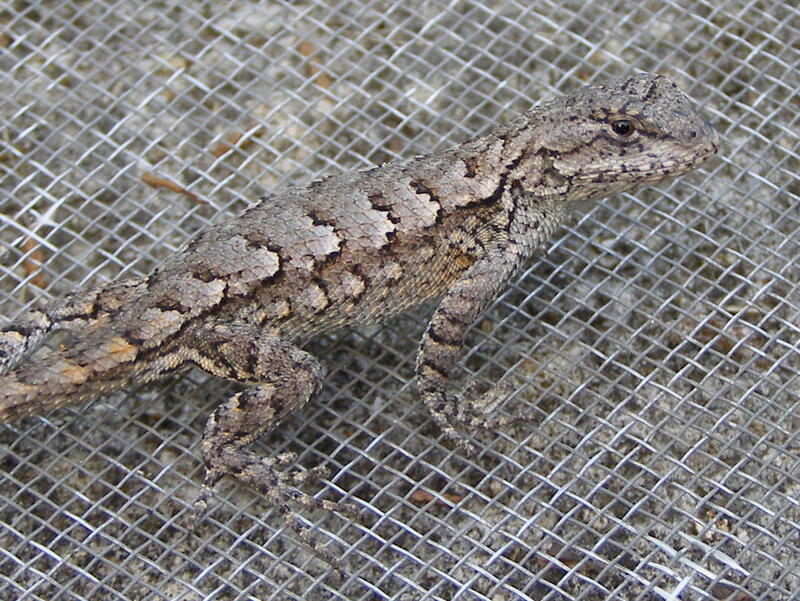 There are four of these lizards that spend their time chasing bugs on the concrete apron in front of my barn door. I’m very careful not to step on them or squash them with a mower tire, but they’re so used to me that they’re not quick to get out of my way. This is their favorite place to seek shelter. Hiding would really be more effective with the tail pulled in. Here he is nice and snug in his hideaway. 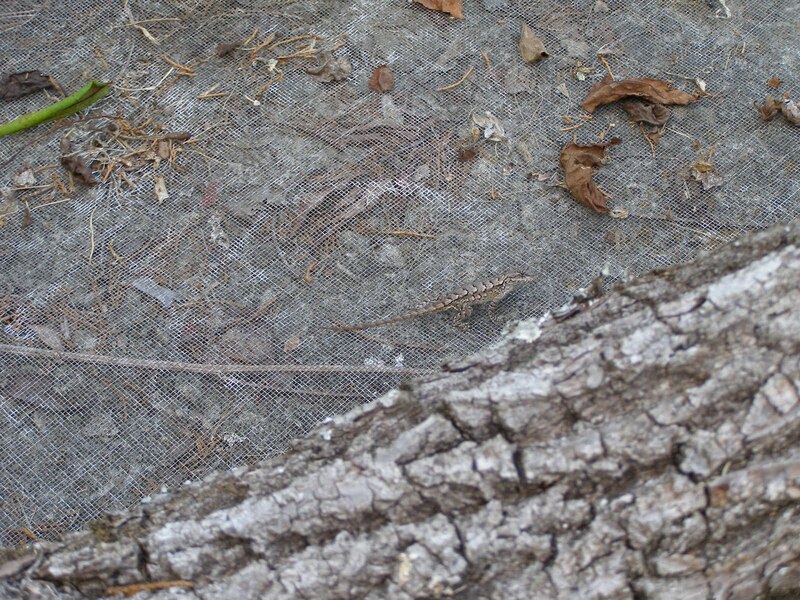 I’ve made piles of dead wood and flat rocks to serve as shelter for Fence Lizards. This spot is not in one of those. The preferred hiding place is beneath the sliding door on my barn. It would be nice if you could explain to wildlife that you’ve created a nice, safe place for them to live and have them go there. Now, every time I open the barn door I have to check for lizards and then open the door very carefully to assure that none of the little guys get caught in any pinch points. This has been a great year for butterflies and now is the time to be watching for southern species that extend their populations into Ohio during the late summer. This is a Little Sulphur, a regular immigrant species found at Blue Jay Barrens. It’s a very flashy butterfly that I may see once or twice each season. This northward expansion is a risky business for species such as the Little Sulphur. These temporary populations are killed by cold winter temperatures and this behavior can appear to do nothing but destroy a lot of butterflies. Species increase their chances of survival by occupying every acceptable habitat they can find and aggressive immigration guarantees that every possible opportunity is taken to improve the long term chances for survival. As has been the case with many other species this year, the area is thick with Little Sulphurs. These three are probing for the last of the moisture from the drying pond. It’s interesting that the above normal rainfall we were having earlier in the year ended abruptly in mid July and we’ve been in drought mode since then. 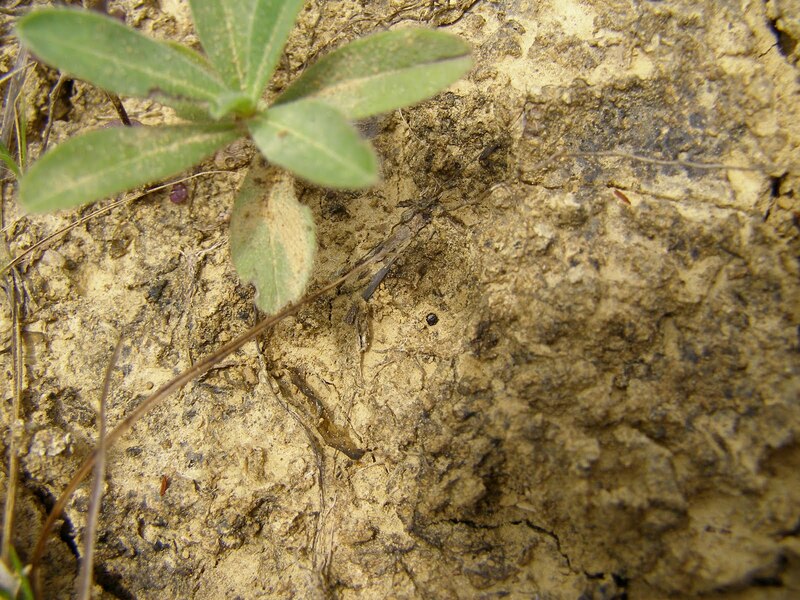 I talked earlier about the butterfly’s habit of taking mineral laden moisture from the damp earth. This puddling behavior provides a great opportunity to observe large numbers of butterflies. Each day without rain brings more butterflies into this last bit of moisture left by the disappearing pond. The pond sediments have shrunk during the drying process, causing cracks to form in the pond bottom. The moisture no longer wicks to the surface as it did when water was more plentiful. These Eastern Tailed Blues have to probe deep to find any moisture. Many of the Pearl Crescents have taken to probing around the base of plant debris. Apparently the mulching effect of the plant material makes it easier to find moisture near the surface. The grouping behavior of the different species reminds me of herds of grazing animals moving across the African veldt. Each butterfly species searches for moisture in a slightly different manner and location. So, like those grazing herds, the different species utilize the same resource, but in a manner that eliminates competition. It would be interesting to make enough observations to know whether this separation of species is a normal thing or if it’s just what’s been happening here during the past couple of weeks. 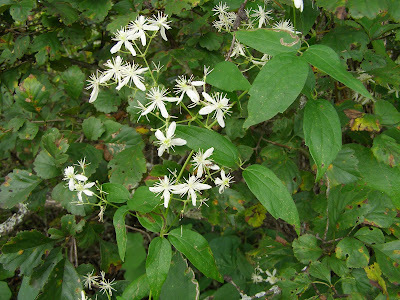 Virgin’s Bower, Clematis virginiana, is a wonderful native plant that would fit nicely into the home landscape. 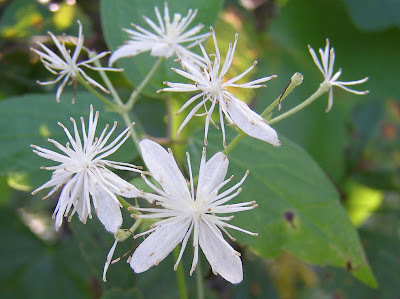 This is a relative to the clematis of the home garden scene and though the petals are not nearly as developed as the garden varieties, the flowers bear a striking resemblance to the domesticated plants many people cherish. The most interesting feature has to be the seed cluster, which resembles a dried, multi-tentacled sea creature. The thick, three parted leaf makes the plant even more recognizable. 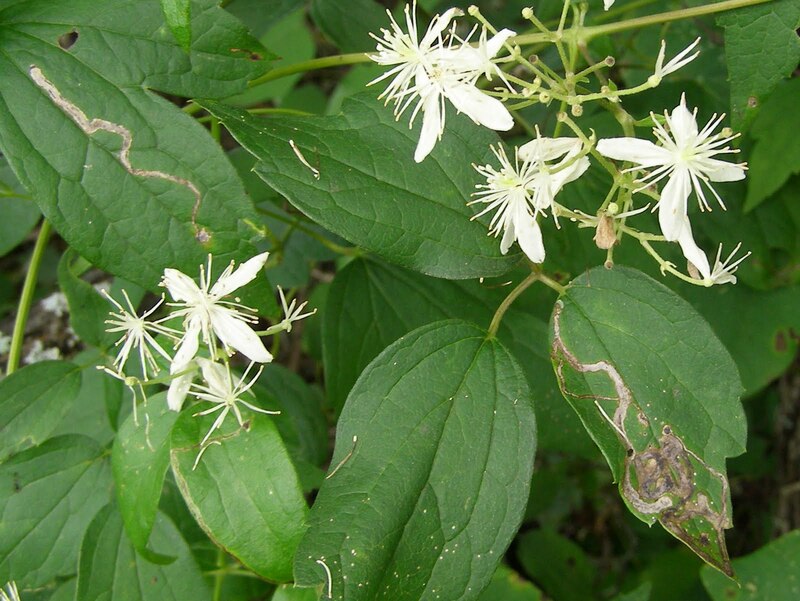 There is an exotic species in Ohio that resembles Virgin’s Bower, but the leaves on the alien have no teeth on their margins. 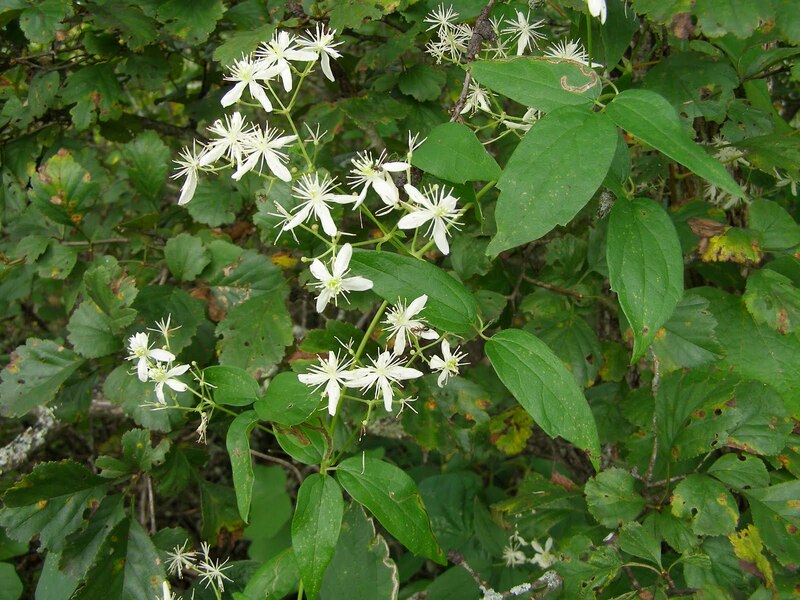 Like most of our native plants, Virgin’s Bower is considered a tasty treat by many species. 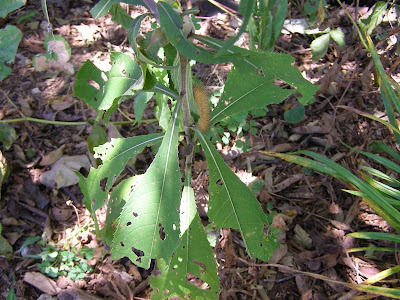 The track pattern on the leaves is evidence that this particular plant is hosting several leaf miners. 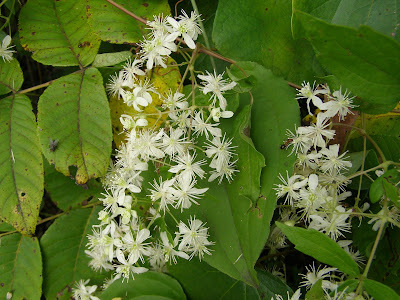 The way it climbs and sprawls over everything in the vicinity is a dead giveaway that this is truly a Clematis. It’s a demure vine that rarely does any damage to the neighboring vegetation. The plant doesn’t go in for deadly strangle holds and it never gets large enough to drag other plants down with its weight. 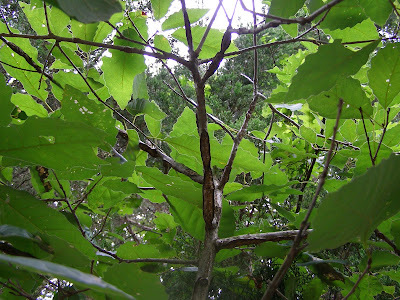 It’s just a nice cohabitant of the thicket. The natural flower color is a bright creamy white that appears to glow even in the shade. Normal pollinators are small bees or flies. Of course, the local ants have found something for themselves in these flowers. My water garden is suddenly loaded with Cricket Frogs. This is something that hasn’t happened before and I’m not sure if they are adult frogs that moved in when other places began to go dry or if they are freshly metamorphosed youngsters. Whatever the reason, I love seeing all of these frogs. Cricket Frogs are neat little things. Although they are considered treefrogs, their tiny toe pads aren’t well suited to an arboreal life style. I guess these are the treefrogs that specialize in roots and fallen leaves. Their warty skin and earth tone coloration makes them very well camouflaged on the ground, but their backs often display bright green patches or stripes. I’m inclined to believe that these are young frogs that developed in the water garden. I heard a Cricket Frog calling in the water garden this spring, so I’m assuming some eggs were laid. Cricket Frogs have bred in the pond many times in the past, but have never moved to the water garden during dry weather. All of these frogs are at the lower end of the adult size range, which also seems to be the higher end of the newly metamorphosed size range. Plus, I saw one that looked like it had a nub of a tail, so I’m looking at them as kids. The behavior of this guy also suggests that it is young. Here, it has spotted a Mound Builder Ant that is pulling itself out of the water. This ant certainly looks like something that should be eaten. Well, I managed to miss photographing the actual attack. The frog lunged, grabbed, spasmed and ejected the ant in less than a second. The ant seems a bit frazzled and the frog appears to be a little wiser. I think an older frog would have already learned not to grab the red and black things that give such a nasty bite. 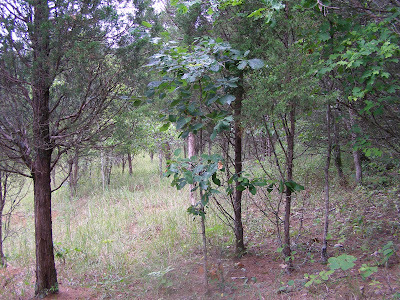 As I emerged from the woods, I stopped to scan the little barrens opening I was about to enter. To my right I could hear something chewing and I turned to find this caterpillar a few feet away busily devouring a leaf of a small Chinquapin Oak, Quercus muehlenbergii. 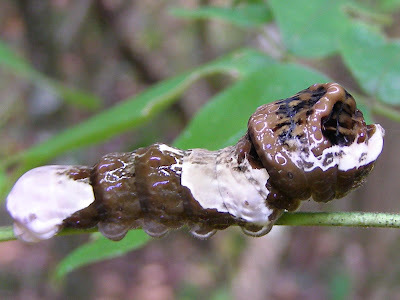 I believe this is the larva of a White-Dotted Prominent moth, Nadata gibbosa. 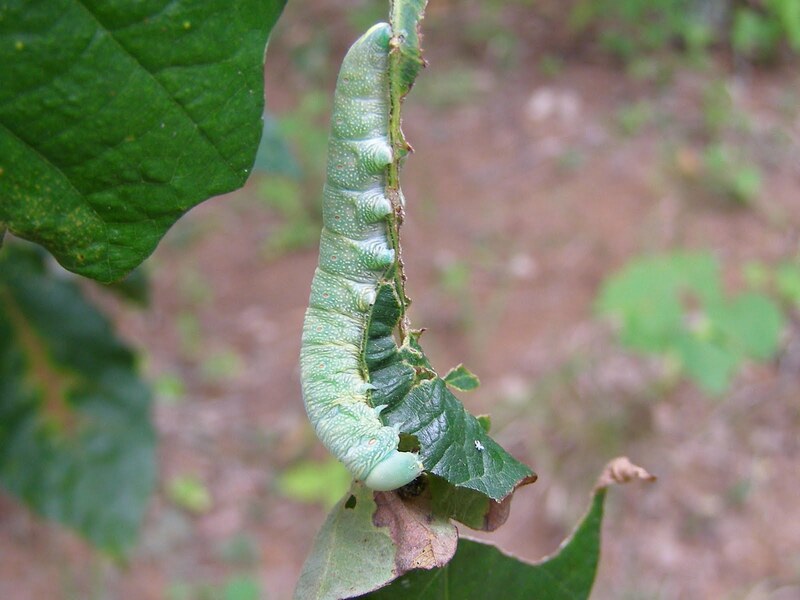 The caterpillar is also commonly referred to as the Green Oak Caterpillar for what should be obvious reasons. 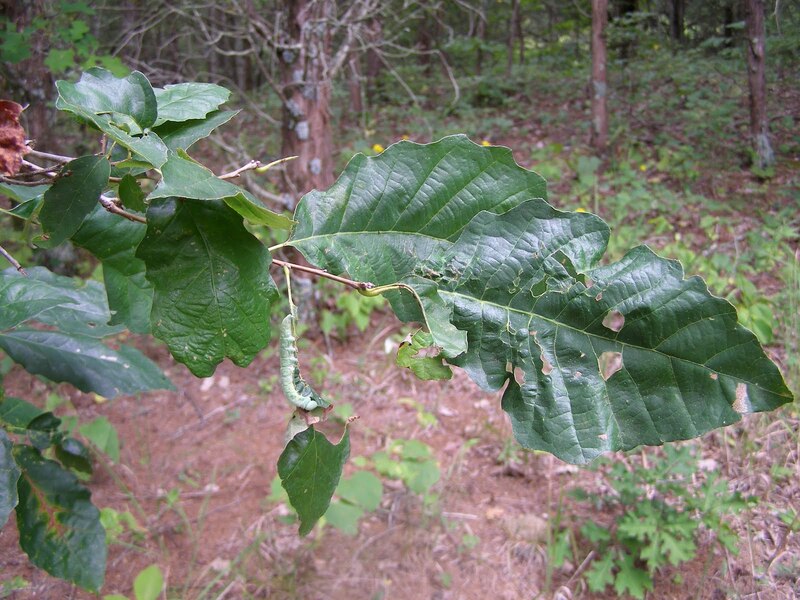 There were several leaves on the tree showing signs of feeding activity and a couple leaves that had been eaten right down to the petiole. 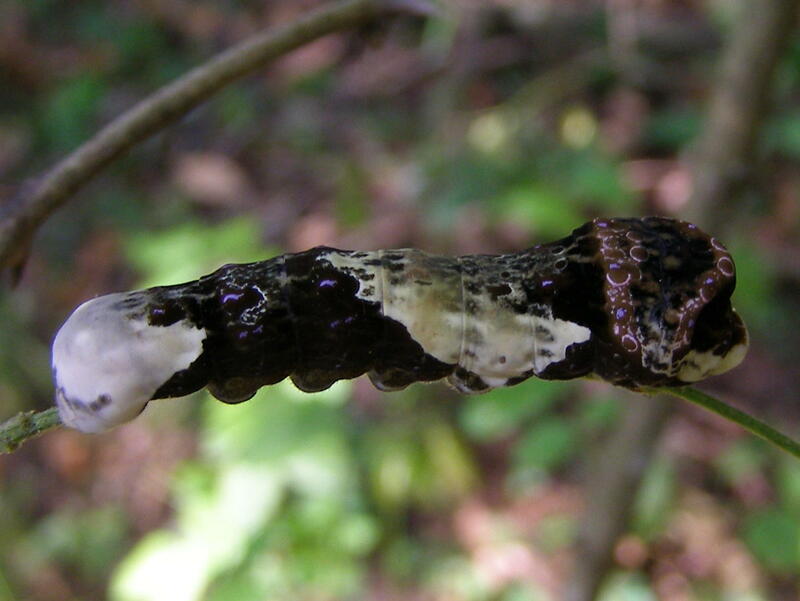 From its size, I imagine this larva will soon be pupating, so the tree shouldn’t be losing too many more leaves. Since it already had my attention, I decided to check the tree over to see how it was doing. There was a lot of damage due to egg laying by the 2008 brood of periodical cicadas. There is a good likelihood that many of these branches will break as the tree ages. Something used silk to hold these leaves together and then ate the lower surface of the attached leaf from the safety of a leaf sandwich. 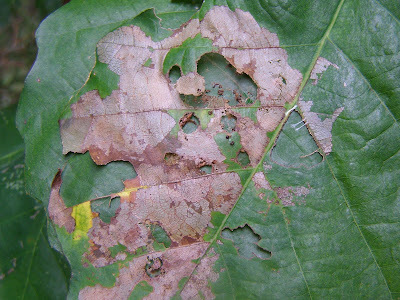 There were several of these areas on the tree, but I didn’t find any sign of the culprit. 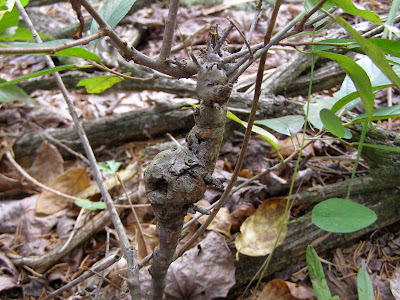 This small oak had an enlarged base typical of most small trees on the barrens. 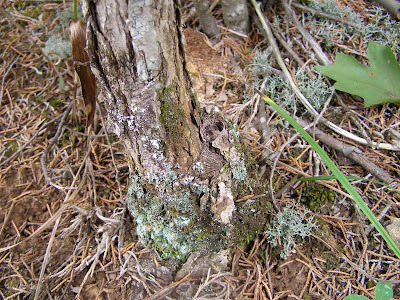 The top growth on these trees often dies back and a new shoot emerges from the base. Since the base has been continually growing from the time the seed sprouted, it becomes disproportionately larger each time the old top growth dies and a new one begins. It’s not an easy life for these little trees. 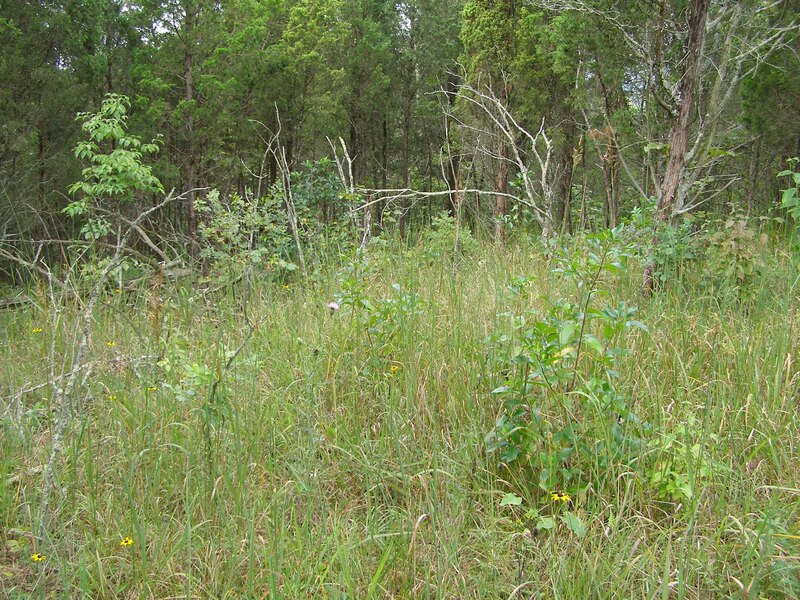 The barrens don’t offer the best of growing conditions, at least for larger plants that need an adequate water supply. 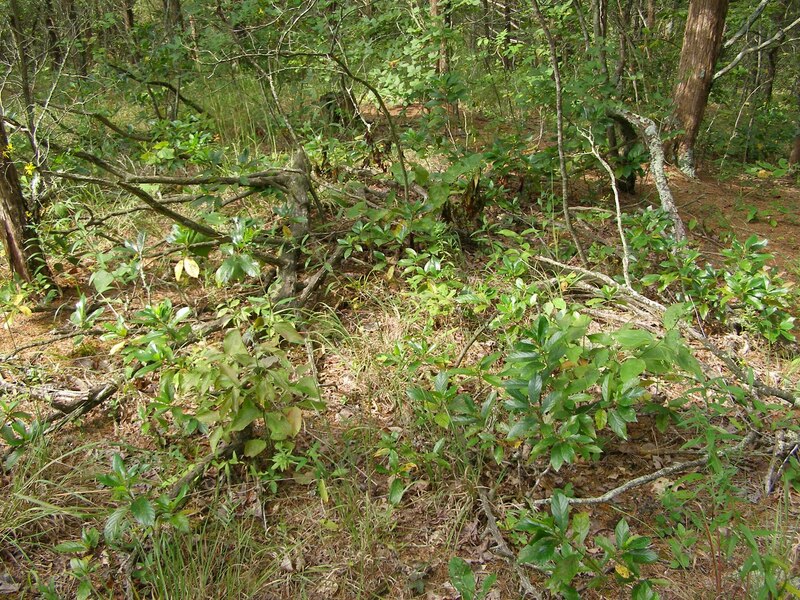 It takes a lot of luck for the small oaks to reach a point where their survival would be considered secure. I’ve been busy searching for Tiger Beetles this summer. I’ve found adult specimens of three species and have been anxious to find my first larva. 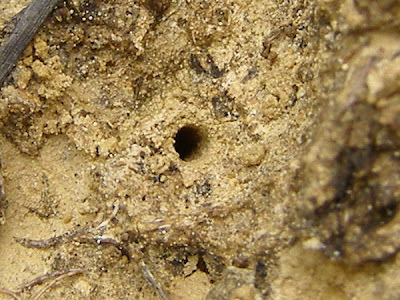 The larvae are found in burrows that they create in the soil. The trick is to find an active burrow and then wait for the larva to come to the entrance where it will wait to ambush small insect prey. My most recent search revealed many pinhole sized burrows in the clay soil. 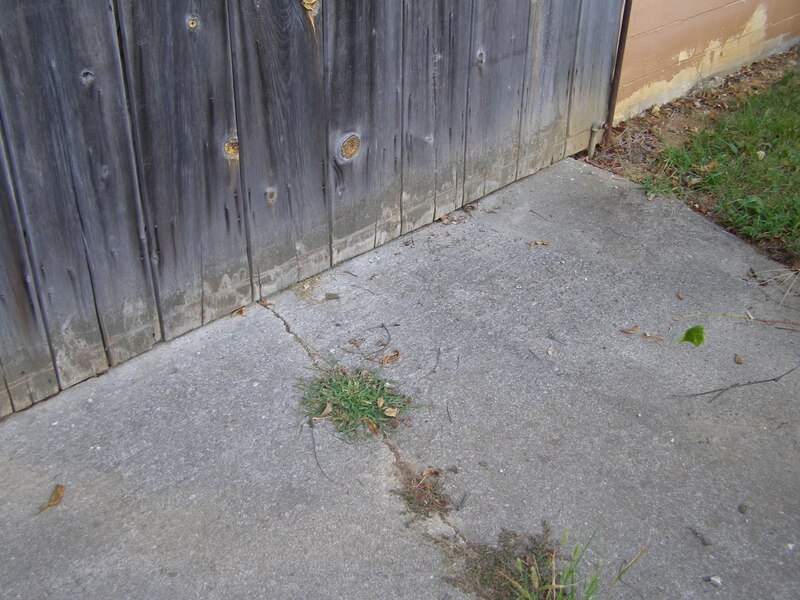 There are many things that make small holes in the ground. 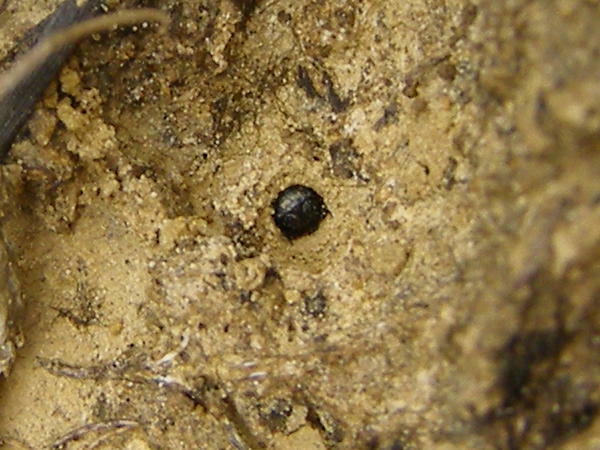 I’ve been fooled by bees into thinking that their burrows were those of tiger beetle larvae, but I’ve never seen a bee small enough to fit into a pin hole. It’s been a couple of weeks since I’ve seen any adult tiger beetles in this location, so I’ve been expecting that their eggs would hatch and the resulting tiny larvae would dig tiny burrows. These holes looked like just what I had imagined finding. I settled down to wait for something to show itself in the hole. After a few minutes, I noticed that there was now a reflection where before the hole had been dark. There was something in the hole. I managed to take several photos, but my camera doesn’t do very well with pinhole sized subjects. 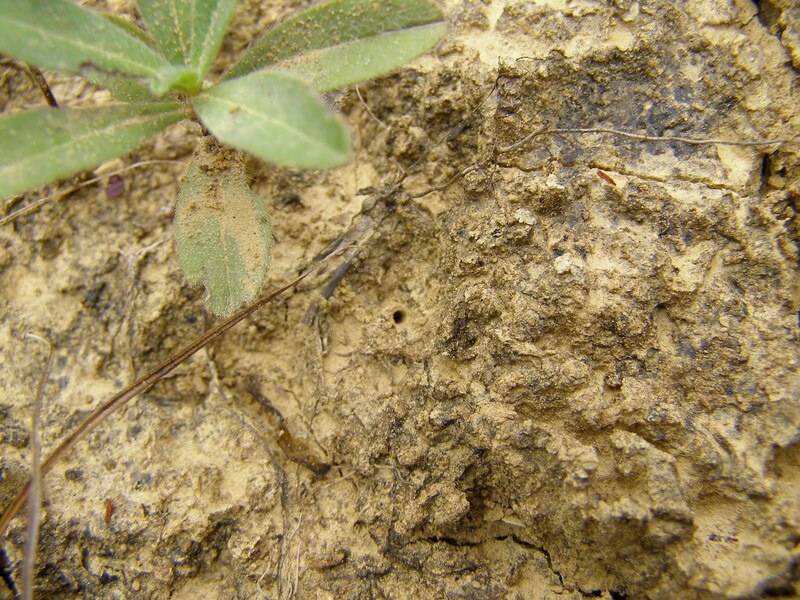 Fortunately, I have a book that shows an unfocused picture of a tiger beetle larva at the entrance to its burrow and my photo is a very close match. As the subjects grow I should be able to get some better shots. I found the pin hole burrows in this area that was earlier filled with adult Cicindela rufiventris. I’m assuming that the larvae represent that species.